How ironic that Meryl Streep, one of my all-time favourite actresses, showed she had been taken in by fake news when at the Golden Globes she was calling us to support journalists? She’s undeniably right that “we’re going to need them going forward and they’re going to need us to safeguard the truth” but the news report she relied on to accuse Mr Trump of mocking a disabled journalist, Serge Kovaleski of the New York Times, was false and used malicious editing. I was myself suckered and horrified by this report when it came out in November 2015, adding this hateful mocking to all of the reasons I disliked Mr Trump – abuse of women, financial legal trickery, belittling of opponents, grandiose statements, etc. etc. It seemed an appalling new low in American politics. When one Bloomberg Poll of American voters asked which Trump statement or incident bothered them the most, more than 60% said the Kovaleski incident was his worst offence. The Democrats began running nation-wide ads featuring the parents of a child with spina bifida in which the father says, “When I saw Donald Trump mock someone with a disability, it showed me his soul. It showed me his heart. And I didn’t like what I saw.” At the Democratic Convention, Bill Clinton said, to rapturous applause, that his wife “never made fun of people with disabilities. She tried to empower them based on their ability.” Mrs Clinton added into all of her speeches and debates that Mr Trump “mocks people with disabilities”. However, I eventually did some fact-checking on my own, as we all should. If we all should be worried about the Russians interfering with American democracy using Mr Podesta’s leaked e-mails, all verifiable, shouldn’t we all also be worried about mainstream American journalists, first, creating fake news, second, propagating fake news, and third, not retracting it after it’s proven false? After all, 60% of American voters were strongly affected by this false report before they voted and Ms Streep is still quoting it today as a sickening historical fact. Consider the evidence. The story began with journalists at the Washington Post, then propagated by the BBC and CNN, then by all the major news networks, not one of which used even the most basic of fact-checking, that of context. The ‘news’ was accompanied by a video-clip purporting to be evidence but if you keep watching, you can see for yourself that he was giving a non-actor’s bad improv of being flustered. How do we know that? 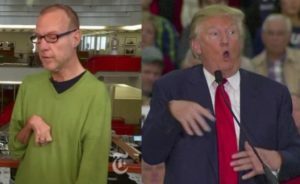 Because in the same speech, he used the same gestures to describe a general who is not disabled but whom Mr Trump believed gave a foolish answer to a question about ISIS. This was malicious editing. In fact, Catholics4Trump have complied a string of video clips showing Mr Trump making the same flapping gestures to describe himself as flustered (17 May 2005) as well as banking officials (31 Oct, 2015), Ted Cruz (19 Feb 2016), and Donna Brazile (29 Oct, 2016). Was he really mocking himself, the general, the bankers, Ted Cruz, Donna Brazile, and Serge Kovaleski as disabled? Besides, as the Washington Post admits, Mr Kovaleski’s disability, arthrogryposis, does not involve him flapping as Mr Trump did. His wrist is frozen in place. The media therefore had to include a still of Mr Trump’s wrist when it was frozen by the camera in the same position as Mr Kovaleski’s normal position. A picture may be worth a thousand words but it can also tell a thousand lies. So, we can criticise Mr Trump as a bad improv performer; we can criticise any and every issue in which we think he’s wrong, but, as a bare minimum, let’s be honest and accurate ourselves. 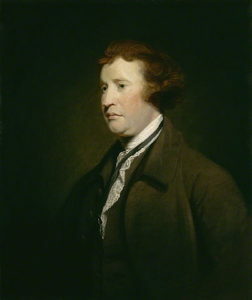 The separation of powers creates a free press, often called the Fourth Estate and described by Edmund Burke as the most important of all because they are to speak truth to the power and authority of the executive, the law-makers, and the judiciary. What then are we do when the Fourth Estate has instead spoken a lie to us all? Remember, this lie about Mr Trump was propagated by the mainstream media who to this day have yet to address and retract it. We dare not abandon the media. It’s not just the truth that needs safe-guarding – so too do all the elements of our liberal democracy including the Fourth Estate. As Ms Streep said, “we’re going to need them going forward and they’re going to need us to safeguard the truth”. Journalists need us, challenging them to address any lack of integrity in their midst. A ‘liberal democracy’ is a country or state based on the liberty and equal rights of all citizens and governed by elected representatives.